A walk through the village of the English bard in Stratford inspired this piece. Shakespeare is as relevant today as he was during his time in our search for love in a world where people have grown cold and the climate is becoming abnormally and dangerously warm. Caring, like a rose, by any other name or in any other place, would exude the same fragrance of joy and hope. It is true in Asia as it is in Europe. Officially, I'm in England and France on a speaking tour of 17 business, management and development schools about hope in our bottom-of-the-pyramid initiative called Gawad Kalinga and its social business offspring Human Nature. Our presence was timely and our cause inspiring to the brightest and the best in top European universities facing an uncertain future in a plundered planet. The radical optimism of poverty-busters from the Philippines - buoyed by the upbeat Asian economies and our trust in our no-nonsense President who is out to curb corruption that drove investors away in the past and many of our ablest to seek their fortunes abroad- served as a contrast to Euro debt woes and Wall Street gloom due to what some moralists describe as obscene materialism and unmitigated greed of the fittest in many sophisticated societies. The Greek leader just got the boot for his inability to manage their economy; the Italian President who loves to spend probably is next. French President Nicolas Sarkozy pro-actively appealed for austerity to students at Strasbourg University on November 8 in a country that invented many global luxury brands. He spoke about depression in the morning; I spoke about hope in the afternoon in the same event. The mostly young audiences I met were eager to hear about innovations and new horizons in the Philippines as they face a fast changing world where an emerging Asian dragon is offering debt relief to former masters of the planet from the West. They want new ideas when old ones in their country don't seem to work so well anymore, when people at home are being sacrificed for cheap labor abroad, when the drive for profit is of calamitous consequence to earth and climate. With me in most of our presentations were Joan Icotanim, a UP business graduate representing Human Nature, with a thesis that a social business can scale and be a market leader with affordable quality products and services that create a greater social impact ; and Olivier Girault, an executive from Orange Telecom, who arranged this tour of hope out of his great affection for the Philippines and his deep compassion for the poor, keeping me on an 8888 formula to cope with the travel and the back breaking schedule; 8 hours of sleep and 8 glasses of water daily to make 8 speeches and 8 meetings a week. He shares our vision to create empowered GK communes built on the principle of social justice (without human rights abuses) and social entrepreneurship as the platform for peace, productivity and prosperity. Like him, many social entrepreneurs are fascinated with GK's capacity to achieve scale with its 2000 communities built to-date and its audacious goal to end poverty for 5 million Filipino families by 2024, adopting a nation-building strategy anchored on the politics of caring and the economics of sharing, working with both government and the business sector. 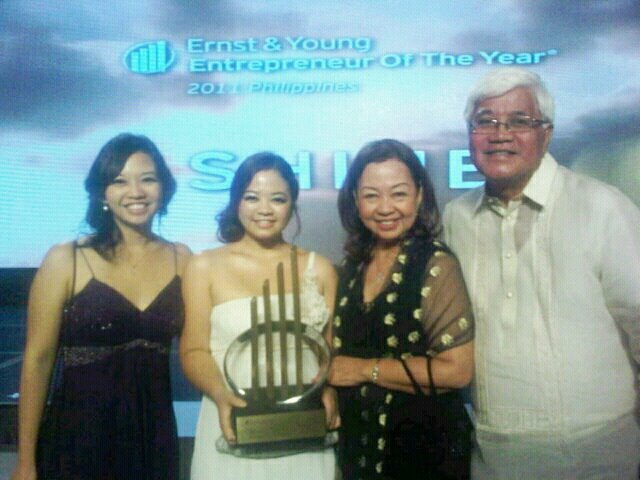 Anna and Camille receive Ernst & Young 2011 Social Entrepreneur of the Year Award presented by their father as last year's awardee for Gawad Kalinga. With them is their mom, Lyn. The award to me (for GK) last year as Social Entrepreneur of the Year by Ernst & Young, Schwab Foundation and the World Economic Forum; and the same award given to my daughters Anna and Camille (for Human Nature) this year, simply affirms that we might be going in the right path in creating a template for philanthropy and profit to merge to do the most good. Our children can be the best guinea pigs for our social experiments to make the world better for them. Caring and sharing as a development strategy and motivation for social business maybe difficult to understand in developed economies with a highly competitive and individualistic culture. But our intentional communities with strong values of honesty, hard work and hospitality designed for sustainability resonate with many young Europeans who are curious about new ways of creating wealth that are kinder to people and the environment. Some are intrigued about the emergence of the East and happy to know that Asia is not just China... that the Philippines is an exotic and exciting gateway to Asia where most of the population speak English. Prior to GK, many of them did not know where the Philippines was in the map. Now it is becoming a popular destination for internship and social immersion, in a cultural setting where Europeans learn to count their blessing and smile with happy people who seem oblivious to suffering. This year we had over a hundred European interns doing mostly an average stay of six to eight weeks, doing humanitarian service or supporting a social enterprise in a GK village and a week off to enjoy the white beaches of Caramoan, the rice terraces of Banaue or the underground river of Palawan (now one of the new seven wonders of the world). They are the most inspiring visitors any country can have. They dug ditches, painted houses, played with the children and loved their adopted families, calling the parents Nanay (mother) and Tatay (father). Their life changing experiences are shared enthusiastically with friends and family through the viral magic of Facebook, you-tube and twitter, spreading awareness of GK and the Philippines. Thousands more are expected to come soon - we already have a long list of applicants for next year's summer program, including 33 MBA students from HEC. Social tourism is the next big thing in the world of travel and we have a massive attraction with our vibrant Gawad Kalinga communities where visitors experience the local culture, practice compassion in action and discover hope. The saddest day of my life was coming home to France after learning to be happy in my village in the Philippines." This was an emotional statement of Florence, a recent French intern at the GK Enchanted Farm at her presentation with AIESEC members at the University of Strasbourg. It was the same sentiment expressed by French Moroccan student Wassane from Lille who marveled at the generosity - despite their poverty - of the residents in her GK village in Iloilo, an island in Central Philippines that was her home for two months. Now many are asking "What's Gawad Kalinga?" Kalinga or caring is simply the mood of the times and the state of the heart. There is something remarkable in the responses of future decision makers from HEC, ESSEC, ESCP, Sorbonne, Insead, Telecom Paris Tech, Sciences Po, EM Lyon, Skema, Strasbourg, Reims of France and wealth creators in England from Oxford, Cambridge, Warwick, London School of Economics, School of Oriental & African Studies and University College of London in the face of present uncertainties and troubles caused by the mistakes of past generations. They were attentive, polite and asked questions that showed a great desire to be gamechangers for their future to be brighter and their world safer. Many now want to pursue causes, not just careers... their life measured by value added to others, not only money earned for self... to seek happiness in people, not just pleasure in things. They will be the enlightened consumers and producers of the new market that will demand better, healthier and safer brands to create greater, shared and lasting value for all. I use GK to make our brand of caring sound easy and classy to the foreign ear - like CK ( for the popular Calvin Klein clothing line). Language, however, was not a problem for me on this trip since my educated audience were mostly bilingual and understood English. It was not even a barrier to a teary-eyed French lady at the Start-up Week-end at ESCP in Paris who said that she understood my heart, not my words. Kindness somehow has a language of its own. Which brings me to the goals of my amazing swing across the top campuses of Europe. First, is to let them know about GK as a unique and holistic brand of inclusive development coming from the Philippines which can be a template for other countries, about the power of vision and action, of heroism and massive volunteerism in finding solutions today to yesterday's mistakes for a better tomorrow. It is also to tell everyone that this is the best time for Europeans to visit the Philippines to promote friendship and long term partnership. According to a piece in the Financial Times, the most attractive areas for investment in the next decade in Asia are the VIP countries - Vietnam, Indonesia and the Philippines. They have stable leadership with political will for reforms, a big natural and human resource base and a rising entrepreneurial spirit. It is best to discover the Philippines early as the rising star of Asia in beauty, social innovation and hospitality, consider it as a wise destination to visit or invest while opportunities abound, make it their home and be part of its ascent in the community of nations. It is for young Filipinos in Europe to feel proud that GK is now entering their schools because Filipinos are quite invisible in the mainstream although there are many of them around working hard and doing well. 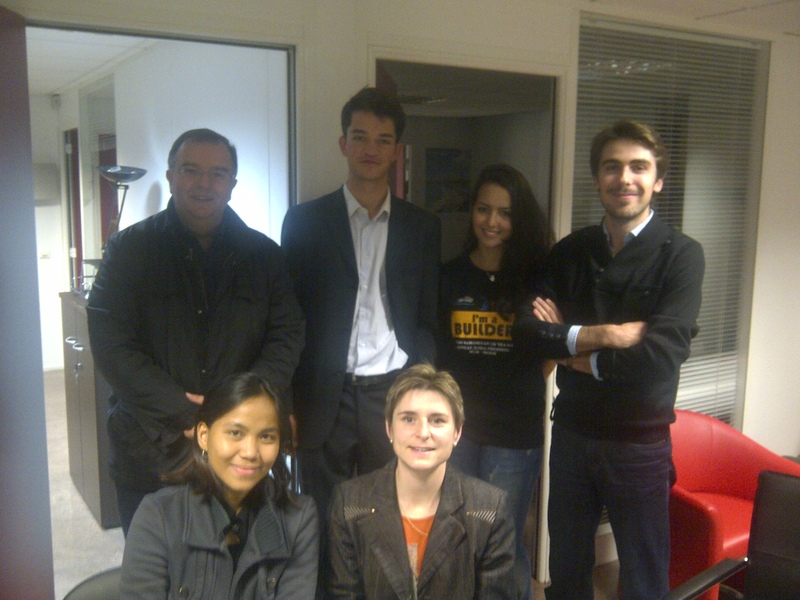 I met some of them - Francesca at HEC, Daniel at INSEAD, Jose at Warwick, Vanezza at LSE and April at UCL - who were amazed to hear a Filipino speak in their school for the first time about the unique nation-building brand from the Philippines that impressed their classmates and big European corporations are buying into it - Shell, Philips, AirFrance/KLM, LaFarge, Akzonobel, Unilever and Nestle, to name a few. I also wanted to encourage Filipinos who have decided to stay in Europe to consider it their home, not just a place of employment; to treat Europeans as family, not just employers. But most importantly, they must speak kindly and proudly about the Philippines, encourage employers and friends to share their dream to end poverty and corruption for a country they have not stopped caring about. I had the most wonderful dinner of beef bourguignon and bourdeux wine at the plush residence of Babette Aquino Benoit near Champs Elysees. She calls both Paris and Manila home and considers Filipinos and the French as family. We also had French cuisine at the home of dear Filipino friends Mandy and Elsie with Bernie and Espie as company. But I topped it with menudo and rice after days of salade and fromage. We can always enjoy the best of both worlds. In Paris I stayed at the Trocadero near the Eiffel Tower, ran by French CEO Xavier Moraga with the help of his cousin Pierre. Both are married to Filipinas, work well with Filipinos, love the Philippines and continue to help when they can. Yes, the Philippines has hit rock bottom and we need all the help we can get because we don't want the next generation to stay down there. One good thing about our delayed evolution is that we can learn from the mistakes of those ahead of us and we can chart a kinder and wiser growth. I admire the French because those I've met have a strong sense of social justice and a touch of class without arrogance contrary to their image in Hollywood movies. They are considerate to speak to me in English because they know I have a problem speaking French. I met some of the most inspiring deans, professors, staff and student leaders in many French campuses and I do not know enough words to say merci. England on the other hand was a visual feast in Autumn. The English countryside was simply breathtaking and the university campuses in Oxford, Warwick and Cambridge are incredibly gorgeous. I'm glad this royal gem is also home, together with the pearl of the orient, for my three grandchildren whose father is from Leeds. In a way my journey was a thanksgiving to God for this extraordinary Englishman whose generosity and passion for GK inspired many Filipinos to care. My son-in-law Dylan deepened my love for my country by leaving his comfort zone, his family and friends in England to live in the Philippines - contrary to migration patterns - and be in solidarity with my people's aspiration to rise from poverty. By loving my daughter, raising his children simply, caring for the poor and building his social enterprise in the Philippines, he has given a fuller meaning to my understanding of Christianity, humanity and sustainability. I am also grateful to Dutch friends from AirFrance/KLM;for making GK their social advocacy and flying me to Europe to spread the good news; and Professor Harry of London School of Economics, who moderated my session and kept me company over sushi dinner (together with GK Austria head Jorge Villanueva who planed in from Vienna) while I was monitoring via Twitter the birth of my seventh grandchild in LA. My wife Lyn arrived from Manila an hour before our daughter Wowie was wheeled to the delivery room. Lily came after dessert. This whole trip is about her and all my descendants, which include the abandoned and the privileged. I thanked God for her safe delivery and celebrated her birth with concrete plans to make her world better. My heir to this planet, dainty Lily - pure and fair - by any other name would smell as sweet.